Thunderbolts Forum • View topic - Planetary Science, or Spread of Disease Before Plumbing? Planetary Science, or Spread of Disease Before Plumbing? In order to keep a little perspective, here is a thumbnail history about the virulence and spread of diseases before the invention of wastewater treatment and underground sewer systems in cities. This period before sewage treatment represents most of history. 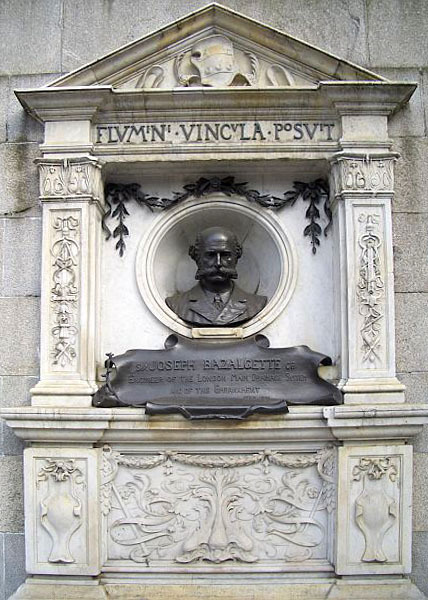 We begin with the work of Bazalgette in inventing and installing the first sewer system underneath London. In his times, there were severe outbreaks of Cholera, and the scientific explanations for the nature of the disease and its spread was a matter of controversy. Some believed it was an airborne disease, and others believed it was a bacterial plague which was spread by the filthy water. Bazalgette, under great opposition from city planners and councils, managed to develop a design of drainage which would carry the city's sewer and rainwater away to the sea, using underground brick passageways and enormous pumps. John Snow was instrumental in gathering and mapping the data on disease cases in London, and he was able to trace the epicenter to a water pump in a certain neighborhood. Both of these men, against expert advice and opinion, managed to prove that the disease was spread by bacteria in water, and in some foods. (Georges Cuvier died of cholera which he contracted from cream.) Today, we can be thankful for the dedicated engineers and laymen who pursued this scientific problem to its conclusion, and which spares us from the worst diseases and epidemics through the responsible planning of our wastewater treatment and also through food processing which kills viuses and bacterium. I hope this adds to the discussion when considering the explanations for the deadly disease epidemics and pandemics in history, and that future generations can feel gratitude and admiration for the people from all walks of life, such as Joseph Bazalgette and John Snow, who solved these enormous problems through their work and inventions. And we also may feel some appreciation for the English-speaking nations which were free enough for these inventors to study and pursue their ideas, and bring them into being. Re: Planetary Science, or Spread of Disease Before Plumbing? This discussion does come with a warning for modern times. There are now cities, such as San Francisco, which allow homeless people and also drug users to defecate on the sidewalks and in the streets, and there are a lot of needles on the same side walks. The homeless camps are also places where diseases have broken out, such as the recent deadly outbreak of Hepatitis, also in California. ref: "Drug Needles and Feces Line the Streets of San Francisco"
Thought: real scientists kill viruses and bacteria. Brigit Bara wrote: We begin with the work of Bazalgette in inventing and installing the first sewer system underneath London. Perhaps you mean the first London sewer system, as ancient Rome had running water latrines and stone-lined sewers. Most history books do not describe the smaller details of everyday life, and thus give the impression that "ancient" civilizations were barely above upholstered caves. Documentaries and books like Ancient Inventions can be a real eye-opener. While things like the "Bagdad battery" may be contentious, there is no doubt that the ancients had many technologies that made the European Middle Ages a true dark age. It was not my intention to detour your posts on disease. It is just that your statement of a "first" sewer seemed ambiguous (first London, or first in history). Galen made records of disease symptoms, and had his own theories of causes, but the discovery of microbes had to wait until later. His surgical tools were top-notch, and indistinguishable from modern equivalents in many cases. Perhaps you mean the first London sewer system, as ancient Rome had running water latrines and stone-lined sewers. Most history books do not describe the smaller details of everyday life, and thus give the impression that "ancient" civilizations were barely above upholstered caves. Thank you Metryq, I was a little careless in my wording and Rome did have latrines (and re-usable sponges to wipe with!) in public places. Long before Classical times, the Harrapans had indoor toilets in houses in India; and Thera, which was probably destroyed c 1700 or 1500 BC, also had toilets in individual houses. I would love to discuss that sometime in a new thread. I meant to earlier last month after a conversation with Lloyd and nick c.
Last edited by Brigit Bara on Wed Apr 11, 2018 5:09 pm, edited 1 time in total. Galen made records of disease symptoms, and had his own theories of causes, but the discovery of microbes had to wait until later. His surgical tools were top-notch, and indistinguishable from modern equivalents in many cases. Galen is worthy of your very limited praise. I am sure there are some of his tools that were of good design as you say, and he did publish a great work on human anatomy. But It was adherence to the writings of the Greek Galen as the authority on physiology and medicine which made medieval medical practice what it was for many many centuries. Galen was able to propagate his ideas through the force of personality and the power of the pen; his total written output exceeds two million words. He had an extraordinary effect on medical practice and his teaching persisted for many centuries. According to the great physician Galen, digestive amulets were often worn on a necklace and rested against the abdomen/stomach or throat/esophagus for greatest effect. [] Also quite common were amulets for fever, which, after all, must have been a major problem in those days before antibiotics and sanitary conditions. I am so glad Metryq pointed out Galen. I forgot that the "doctors" of those days spread more disease than they cured. You were almost guaranteed to die of sepsis if you went to a hospital, until relatively recently. It is still a good idea to get out of a hospital immediately, if not sooner, if you must go to one. @Brigit, thanks for the link. I shall have to read the rest of that thread. Archaeology is one of my interests, but there never seems to be enough time to read everything, on top of tending to routine daily matters. Being aware of the advanced technologies of ancient civilizations makes it that much easier to accept the more Velikovskian and Cardonan notions of EU. Our ancient ancestors were not superstitious savages. They knew their world quite well and likely observed some amazing events. Western hemisphere ("Native American") civilizations can tell us many things, if we're open-minded enough to listen. Overall, while I can't prove it, I sometimes think that blood-to-blood diseases are some of the very worst. They also happened to be linked to bad behavior...needles, etc..
Never mind. I love those Lysol wipes they provide at stores! H.G. Wells' Martians never had a chance.